Minted by the Mexican Government, it depicts the Mexica coat of arms, with an eagle battling a snake upon a cactus. This represents the people fighting the enemies of Mexico. It was first issued in 1921 to commemorate Mexico’s independence. The Mexican 50 pesos coin has one of the world’s most arresting designs. With a purity of 21.6 carats, a gold content of 1.2057 and weighing 41.67 g, it is also one of the most valuable mass produced coins of its era. 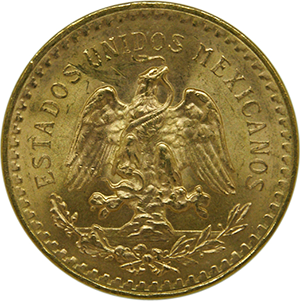 First minted to represent Mexico’s independence in 1821, it depicts the Mexica coat of arms, an eagle attacking a snake perched on a cactus, a representation of the Mexican people fighting its enemies. The Mexican pesos relates back to the “Real” or Spanish Dollar, which was widespread in the region, and accepted as legal tender in the United States until the coinage act of 1857. This was soon followed in 1863, by the introduction of the centavos, worth 100 pesos. It was from here that the peso began to resemble the coin we know today. The word peso derives from the Spanish “Pesos ora” (which translates as “Gold weights” and “Pesos plata” – “Silver weights”. In this regards, it is similar to the British pound. <p<From humble beginnings, the peso has become extremely widespread and is currently in the top ten most traded currency in the world and the most traded in Latin America. In the 20th century the Pesos proved to be the most stable and reliable currency in the entire region, which has partly led to the coin being so popular with investors, while collectors are often drawn to the coin’s design and historical context. Like most government issued coins, particularly those from trusted mints, the 50 pesos gold coin is a relatively reliable investment. It is highly recommended, however, that any precious metal product be bought from a reliable source. Goldinvestments.co.uk are one of the country’s oldest and most renowned vendors. We also have a highly respected and experienced customer service team based in our London office, from which we are happy to provide advice.